Although Skinny Pigs do not differ very much than regular guinea pigs they do require a bit more care. On this page I will show you how to care for your Skinny Pig so that they are always happy & healthy. Please remember that I am only a hobby breeder and not licensed veternarian so please take all information as personal recommendations only. And remember when in doubt it is always best to contact and confer with a professional. 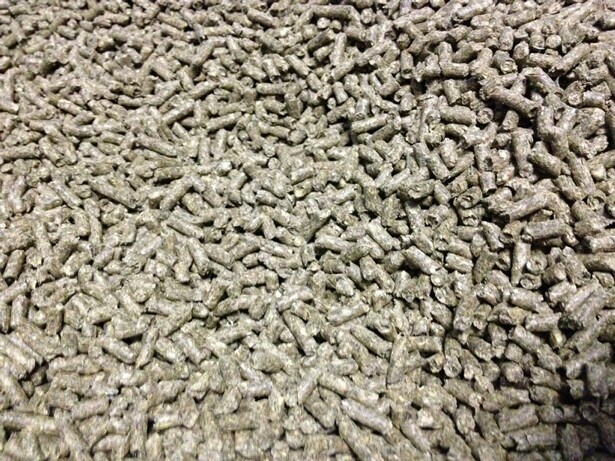 A a pellet food, I feed Buck-Eye guinea pig feed. 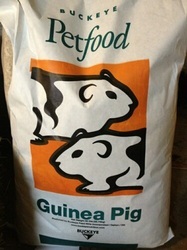 It is said to be fortified with Vitamin C which is essential to cavies. 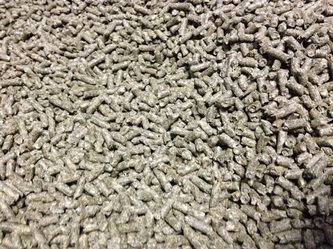 However, the amount of Vitamin C in bags of feed quickly decreases after the bag has been open. My guinea pigs also have an unlimited supply of Timothhy Hay.I purchase mine by the 70 lb. 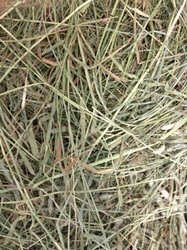 bale so that everybody has tons of hay to eat & play in. 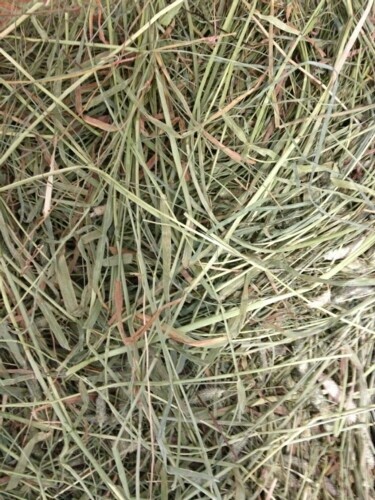 Hay is important to Guiunea Pigs as it is extremely healthy for them, it helps wear there teeth down, and it is used to hide in as well. 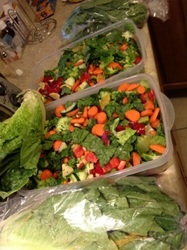 In addition to Buckeye and Timothy Hay, I feed pleanty of fresh veggies. 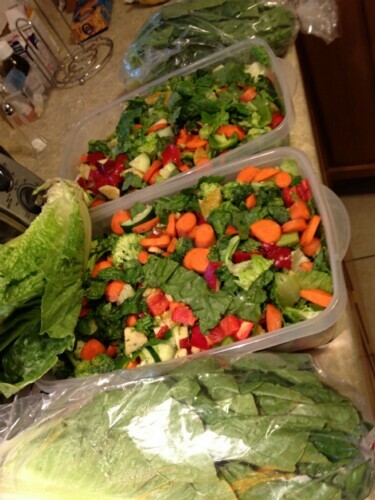 Usually daily, I feed Romaine Lettuce, carrots, and fresh spinach. A few times a week, I feed broccoli (florets included), bell peppers and zuchini. Occasionaly I feed oranges, apples, cucumbers, and bananas. Since Skinny Pigs do not have fur they get cold cold very easily. If your Skinny Pig is cold they will sit still and shiver in an effort to keep warm. Your Skinny Pig could quickly contract a cold, or pnemonia from being cold. If the area where your skinny pig's cage will be kept has a draft I deeply reccomend purchasing a small room heater. It will keep your room warm & your skinny(s) will appreciate it. If the room where your skinny(s) will be kept is fairly warm I reccommend taking a towel and laying it across the back and part of the top of it's cage. This will contain the heat in the cage and will help keep them warmer. Skinnys should NOT be kept in an area at which the temperature reaches higher than 78 degrees, or drops lower than 65. I personally keep my Skinnies at a temperature that is usually 66-70 degrees Farenheight. 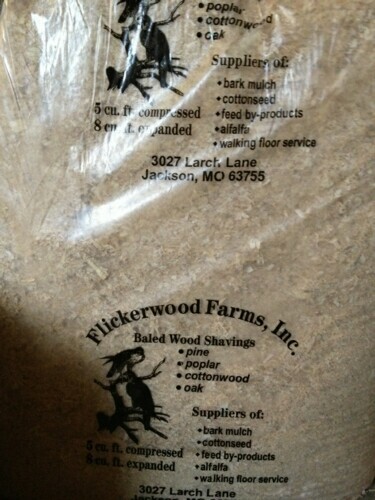 When using bedding I use Pine shavings & fleece. For pregnant or nursing sows, I place a few layers of fleece onto their cafe to keep them more comfortable when they are laying down. 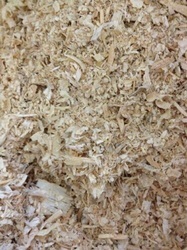 All of my other piggies live on soft pine shavings. Especially in the winter, I give everyone a little fleece blacket just to ensure that they are kept plenty warm. There are plenty of other types, and brands of bedding. 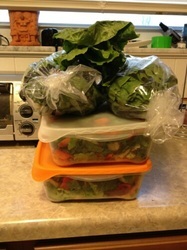 Here are just a few of the many, Carefresh, Aspen, Woody Pet, and Yesterday's News. 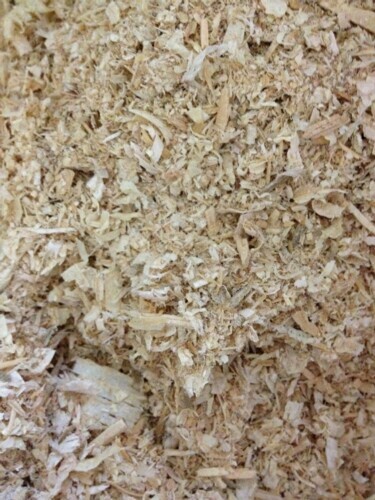 You can also combine beddings to create a mix such as a layer of wood shavings, and then a layer of Carefresh. However do NOT use beddings such as cedar, sawdust, straw, corncob, or straight newspaper. Cedar has been proven to contain aromatic oils that can be toxic to guinea pigs. Since guinea pigs are low to the ground they can easily inhale the fine particles of sawdust which is extremely unhealthy for their delicate lungs. Corncob can mold quickly mold making your guinea pig sick & straight newspaper must be changed very frequently as it does not absorb liquids very well, and does not control odors. I believe that cages should be fairly large instead of small. Having a small cage prevents proper exercise which can lead to overweight guinea pigs. Also a small cage must be cleaned much more often causing you to spend more money on bedding. Having a larger cage has many advantages such as more room too run, less cage cleanings, happier guineas, and an overall happier life with your guineas. I am currently using large pet store cages (I have cats that would find a way into a C&C cage and I don't want to risk them) Most cages are good as long as they have plenty of room to run, are safe with no pieces sticking out, and have proper ventilation unlike an aquarium. No guinea pig, let alone a skinny pig should be forced to live outside. The temperature could easily drop and make your piggy sick. However if you want to take your guinea pig outdoors to get some fresh air, or as a treat you need to take a few easy precautions to ensure that you will not be accidently harming the health of your Skinny Pig. First of all, never leave your Skinny pig, or any other guinea pig for that matter outside alone. You should sit right next to it just to ensure that nothing serious could happen to you precious piggy. Secondly make sure that it is not too hot or too cold. If you are taking a regular guinea pig outside the temperatures can range from 65-75 degrees Farenheight. If you are taking your skinny pig outside be sure that the temperatures are from 70-75 degrees Farenheight as Skinny Pigs can get cold easier. Be very careful and watch for cats, dogs, foxes, or hawks as they could be potential predators. So as long as you stay with your guinea pig, and ensure that it is the proper temperature for your pig you should do okay. Skinny Pigs do not have regular health problems. They are just like regular guinea pigs just without fur. Since they do not have fur a Skinny Pig can contract just a few skin problems. Below you will find the most common and the ways to treat them. Since Skinny Pigs do not have fur their skin is exposed. That can increase the risk of minor cuts and scrapes. To protect against scratches try to be especially careful when choosing bedding types. Inspect the cage for any sharp corners and be sure to look over your skinny to make sure they do not receive any scratches. If you Skinny Pig does happen to get a cut or scrape and it bleeds execessively do not hesitate to take your guinea pig to the vet. They should give you something to help prevent against infection. If it is very minor, like a small scratch that is not open or bleeding exessively clean it up, and watch it very carefully. Some Skinny Pigs will develope dry skin patches. You can easily tell by looking at your Skinny Pig's skin and if you notice areas of dry skin you will know that your guinea pig has a simple case of dry skin. To heal it back up again it is a good idea to purchase a good quality baby lotion. I have used it and the only down part is that the baby lotion can be almost cold. I put some on my hands and blow on it to make it warm. Quickly put your Skinny Pig back in his or her's cage so they can warm up. (Be sure that the lotion is completely rubbed in as the bedding will stick to your Skinny Pig. Sometimes when the Skinny Pig's fur is growing on their face you will notice that some a few hairs are poking your Skinny Pig in the eyes. When I got Gremlin I noticed that he had one little hair that was growing into his eye. I hadn't read about this, and I wanted to be as comfortable as possible so I decided to ask the breeder that we received him from. She said that Skinnie's fur comes out easily, and to just pull it out. This was our first time dealing with it so we had one person hold his back still, one person to make sure he didnt jerk his head at the last second, and one last person to pull the little hair. It turned out fine. He jumped a little bit when we did it but was quickly settled down again by his Romaine lettuce. Skinny Pigs are very susseptable to sunburn because they do not have any natural protection such as fur. If you decide to take your Skinny Pig outdoors be sure to stay in the shade and to use a high SPF sunscreen. Remember you and even Skinny Pigs can receive a sunburn even on a cloudy day.